Netflix reported its Q1 '12 results yesterday, adding almost 3 million subscribers, of which 1.7 million were domestic and 1.2 million were international, while showing its first loss in a while. Focusing just on the domestic side, the 1.7 million additions are certainly a positive reversal from the past 2 quarters, but are just about half of the 3.3 million domestic subscribers added a year ago in Q1 '11 (see chart below). While Netflix is forecasting to add 7 million subscribers in 2012, the company's domestic expansion rate is clearly slowing from its torrid pace of a year ago. Netflix's decision to practically abandon its core DVD business continues to be a major drag on the company, a point I've made numerous times previously. In Q1 the company lost about 1.1 million DVD subscribers, most of which occurred among those in the "hybrid" streaming-DVD category. 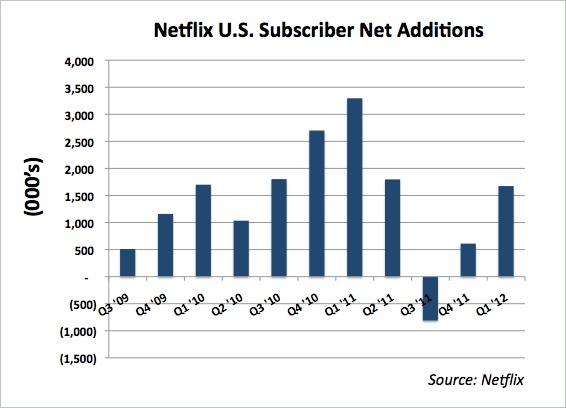 Netflix said it now has 7 million such subscribers, down from 8.4 million in Q4 '11 and 11.6 million in Q3 '11. That 4.6 million attrition is no doubt directly due to the company's decision to aggressively raise prices last summer and its bungled explanations. Despite the drop in hybrids, and Netflix's decision not to promote DVDs, subscribers for the DVD-only plan appear to be relatively stable, in the 2.7M-3M range. More important, when viewed on a profitability basis, Netflix's DVD subscribers are still the locomotive: in Q1, the 11 million DVD-only and hybrid subscribers accounted for $146.1M of contribution profit (a 45.7% margin), while the 23.4M streaming subscribers accounted for $66.5M of contribution profit (a 13.1% margin). All of that brings me back to the core strategic error I believe Netflix made last summer, to de-emphasize DVDs. Regardless of the fact that the long-term is very much about streaming, tons and tons of content is still only available on DVDs, and Netflix had a highly-defensible business in next-day disc delivery. 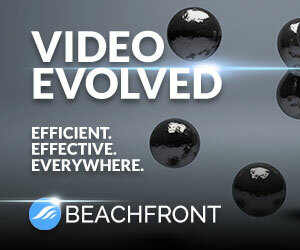 While DVD postage and content costs were escalating, it was still a healthy line of business, which should have been promoted front and center, paired with the streaming augment. This would have helped insulate Netflix from streaming competitors and preserved revenues and profits, while helping fund international expansions. Instead, Netflix has alienated millions of hybrid subscribers, sending them to the exits, while new streaming additions don't come close to growing the company as quickly as a year ago. In fact, there was healthy skepticism among analysts on the earning call yesterday that Netflix will even accomplish its 7M streaming subscriber acquisition target for 2012. Meanwhile, competition looms. Redbox is already benefiting on the DVD side and will roll out a new service with Verizon later this year. Amazon, Apple and Google have yet to be fully heard from. And major Hollywood studios -via their premium TV partners - have essentially closed the door to Netflix gaining access to blockbuster films, pushing the company into original productions, by necessity. All of this and more are contributing to Netflix stock being down another 14% so far today.